How do you do things? How do you complete something you set out to do? I never get anything done. Not on my own. I mean: I have finished a couple first-draft novels on Nanowrimo in past years, but that required such an exhausting expenditure of nervous and emotional energy I nearly stopped writing afterwards. Especially in the year when I did *two* novels for Nanowrimo. But I lack that energy now, and I lack focus, and other things are going on, and so forth and I find myself sitting here, wondering, how do you guys do it, you guys who finish things. I am thinking of creative projects – how do you artists actually finish one painting and then start the next – how do you photographers get yourself outside taking pictures, or into the studio, or whatever – how do you musicians music? – but this would apply to non-creative projects as well – fixing one’s relationship, parenting, planning, household chores, shopping for a new suit, looking for a new job. Only collaboration works for me. I am getting music done thanks to Horst. Evco got off the ground because it was a group project and because, at the end, Ute grabbed the controls from my paralyzed hands and landed safely. But other stuff – writing, painting, photography – I sit on ideas until they calcify and inhabit my body like unborn twins. I guess I have answered my own question, for me – I need a project manager, I need a collaborator. Silver nitrate solution sloshed out of my dipper tank the last time I was making wetplate collodion photographs in my backyard and by the time I noticed I had dripped a trail of photosensitive heavy metal solution down the cellar stairs, across the big room in the cellar into my workshop, which exposure to ultraviolet light was rapidly turning black. What should I do? Easy peasy. Take some sodium thiosulfate fixer solution, wet a paper towel and use that to wipe it up. Wear gloves, because I think I remember hearing it’s carcinogenic. Works like magic on tiles. Pets and carpet, not so much I figure. Under no circumstances use cyanide fixer, because that contains cyanide and will kill you. And safety goggles, because silver nitrate in the eyes will blind you. And remember this is time-sensitive: you must get it all cleaned up before your wife notices, or she will ask you to finally get all these funky chemicals out of the house and into storage somewhere with better fire insurance. I had been kind of worried about these thistles this summer. I had meant to shoot them last year but never managed; this year we are having a heat wave and I was afraid it would happen again. Made time this morning though and did a few. 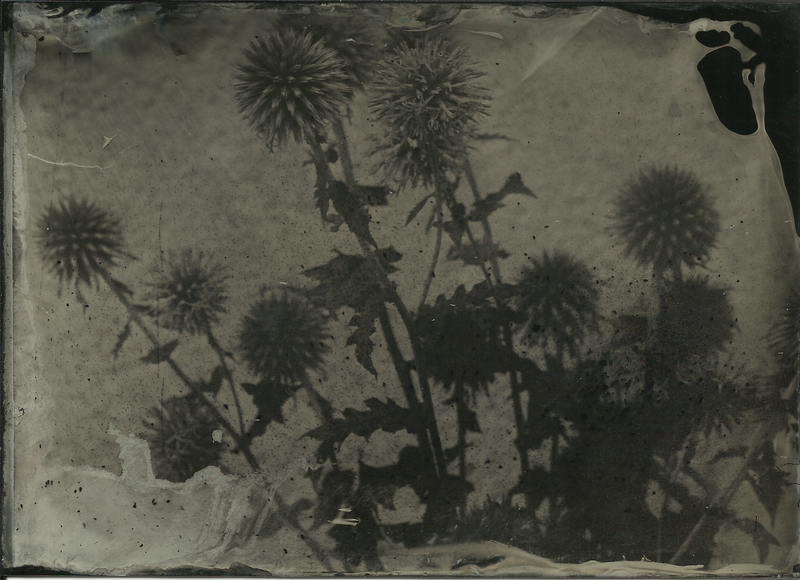 I really like these thistles. I planted them several years ago after someone at the nursery told me local bugs like them. They are popular with wasps and some black and yellow hornet-looking guys; I was surprised no one stung me when I cut a few to put into the vase. 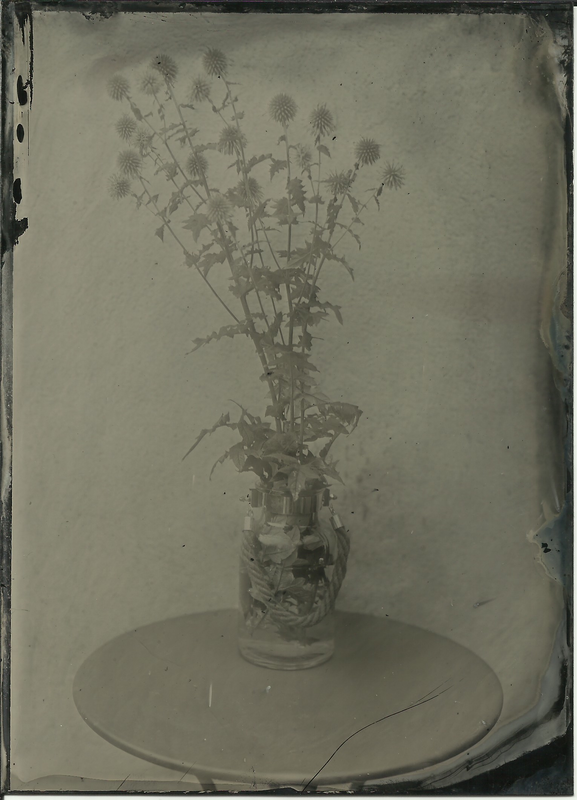 Thistles. 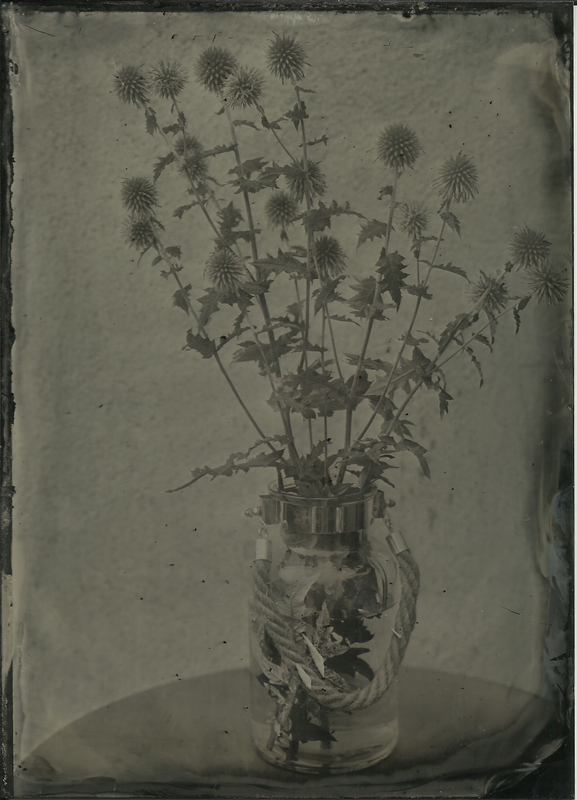 F11, 20 seconds, Reh’s new generation collodion, shade, hot day. Thistles. 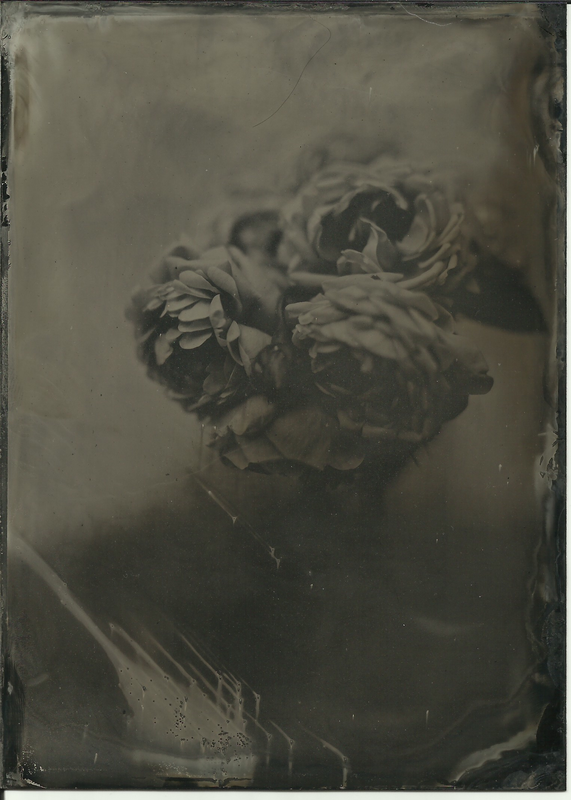 F3.5, 1 second, Lea’s portrait collodion, shade, hot day. 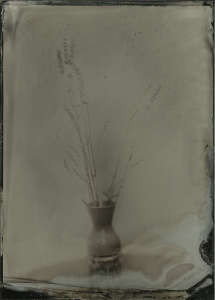 It was windy today but calmed down long enough to make three plates of flowers – a red hollyhock and lavender, both picked in front of the house. 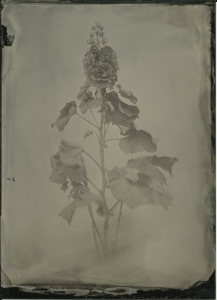 Red hollyhock, 13x18cm black aluminum, Lea’s portrait collodion, f3.5 2-3 seconds, normal developer 8-10 seconds. 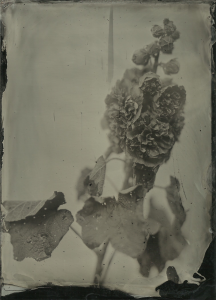 Red hollyhock, 13x18cm black aluminum, Lea’s portrait collodion, f4, 3 seconds, sugar developer 10-12 seconds. Lavender from the bush in front of our house. 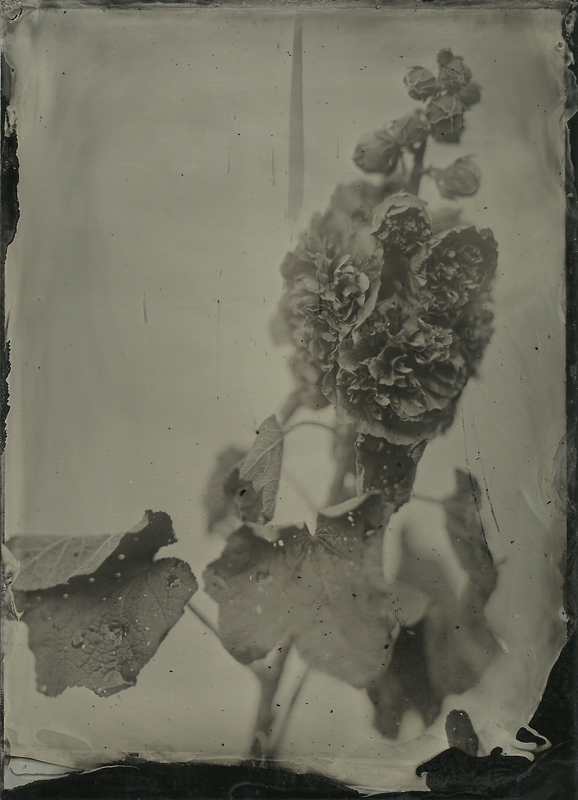 13x18cm, black aluminum, Bohemia collodion, f3.5 2-3 seconds, overcast, sugar developer 10-12 seconds. Bluish-purplish flower in my backyard. Maybe some kind of echium? 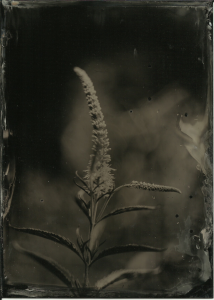 Bohemia collodion, f3.5 or f4, about 3 seconds, cloudy/rainy (the black spots are from raindrops that hit the plate after I’d poured the collodion but before I sensitized it. Regular developer, 15 seconds. I’m not crazy about the composition, but I was in a hurry because it started raining pretty hard. As soon as I had put everything back into the house the rain stopped and the sun came back out. Allium, direct late morning sun. f3.5, 3 seconds (flowers moving slightly due to very light breeze. 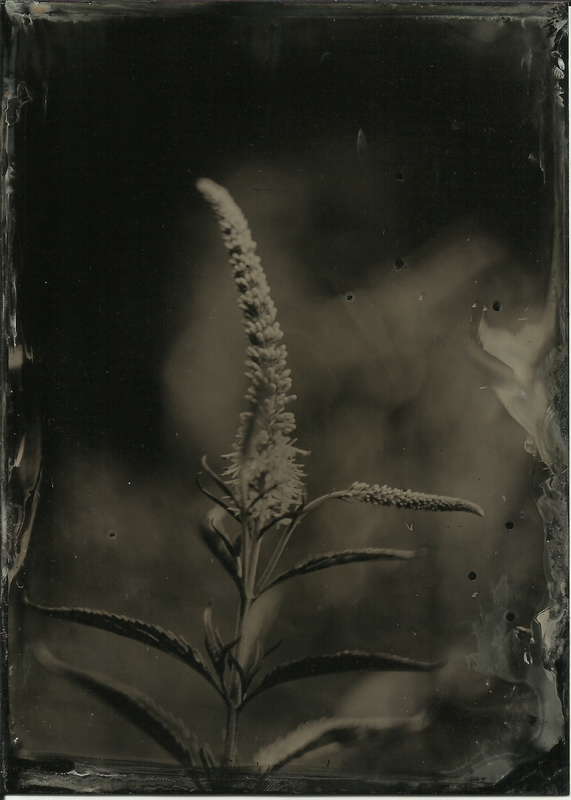 Bohemia collodion, sugar developer 12-15 seconds. 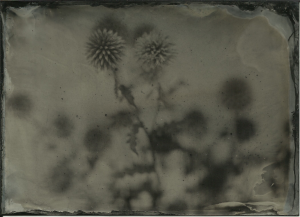 Shot on black aluminum plate, 13x18cm (5x7in). 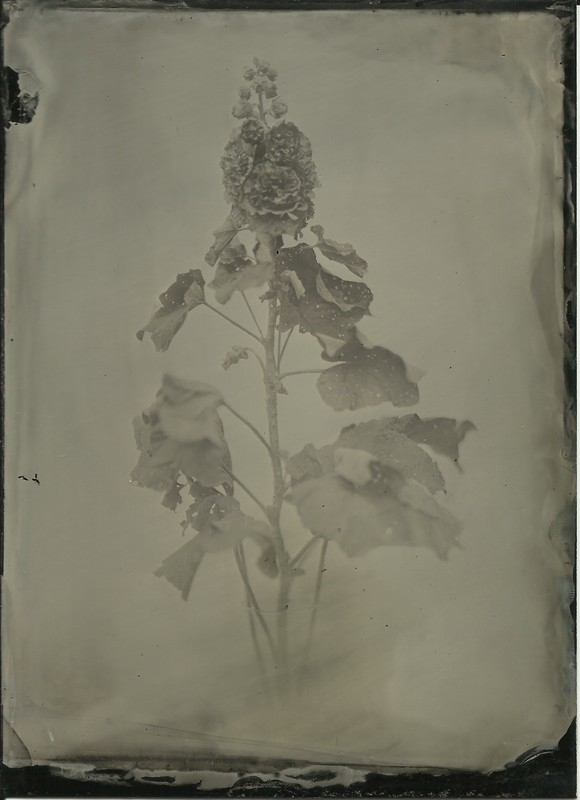 It is hot out this weekend, supposed to hit at least 32c today (about 90f) so I used sugar developer, which slows down development, because my normal developer has been working very fast lately anyway, resulting in overdeveloped plates. One aims for 15 seconds developing time, and for previous plates with normal developer the midtones were out after about 8 seconds, and if I went longer I ended up with fogging etc. The sugar in the sugar developer mechanically (I believe) slows development, useful in hot weather. 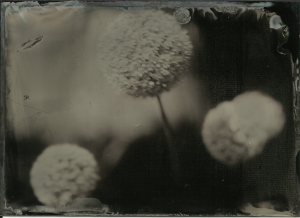 The two plates I shot today of the allium in my back yard took 12-15 seconds and were, overall, of satisfactory quality, at least no overdevelopment. The only two problems I ran into this morning, besides something or someone spilling a small beaker of developer (the cats were around, and someone was watering the garden) were: 1) there was a slight breeze, which resulted in the long-stemmed, heavy flowers swaying/moving and so blurring during the 2-3 second exposures. 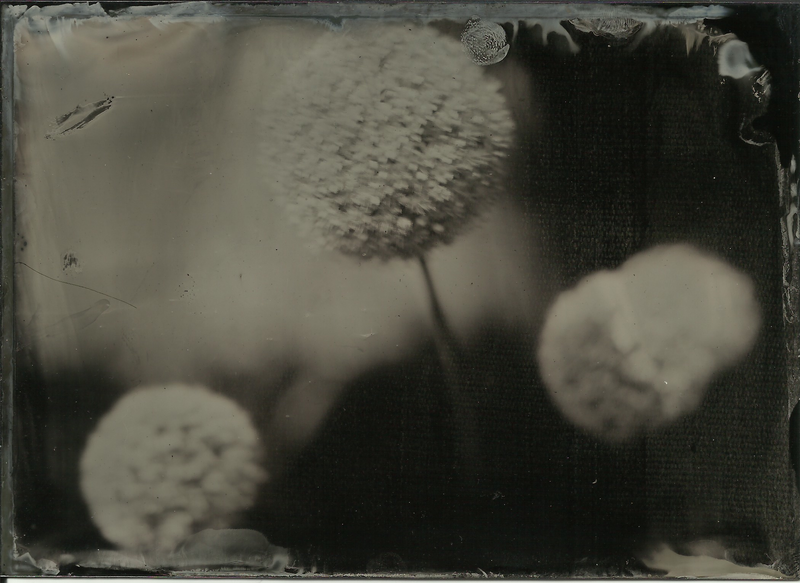 For the second plate, shown here, I stopped the largest flower with my hand before shooting, but it still moved a little. 2) The second problem was the plate itself. There is a scratch at the middle of the left edge. I would assume I had done this removing it from the silver bath, or in the plate holder, but other plates from the same source also have this scratch. 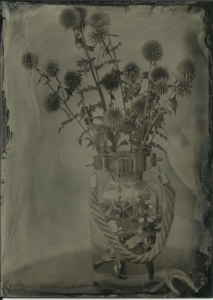 Also there is a sort of texture to the plate, that kinda grid pattern on the right side, which I think is connected with the protective plastic layer over the plate, or something else from the production process. If this turns up with many more plates I shall find myself forced to contact the seller. Otherwise, I am happy with the image. I got a good night’s sleep last night and as a result feel human today. Although Monday, today is a holiday. My wife is away on business (she texted me this morning that she was still alive, a few minutes after a 5.4 earthquake in Tokyo), the kids are resting and/or studying, the cats are sleeping. So, after vacuuming the downstairs and mopping a few floors I saw no reason not to set up my photographic gear and make a couple alutypes in the backyard. Initially I wanted to take a picture of the rosebush in the flower bed in front of the house, but it was too windy – the roses would have blurred too much with a 2 or 3 second exposure. 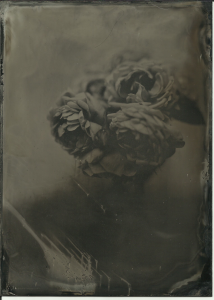 So I picked some roses, put them in a vase and took pictures of them on a table against the wall of the neighbor’s shed, which is white-ish stucco. I tried a couple different collodions. 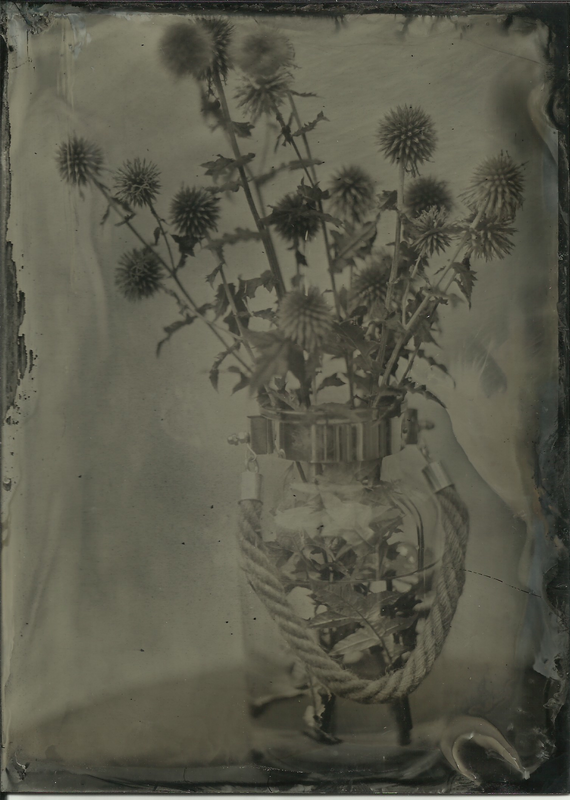 The first picture uses a newer collodion, which is quite a bit faster than that used for the second picture, it being both a different formula and about a year old – normally, I believe, one uses collodion up after a few months because it gets slower over time and also maybe unstable, but I’m not sure. I’m just trying different things out. It went well today, I was happy with the first picture, which was only a test really. Less happy with the second, which came out a little dark. They will both get darker again when I varnish them tonight. Roses from the bush in front of the house, in glass vase on grey table in front of white wall. 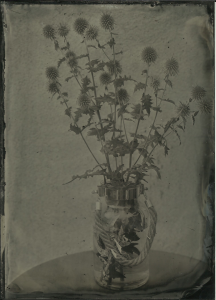 Bohemia collodion (IIRC), f3, 2 seconds, aluminum plate, partly sunny. 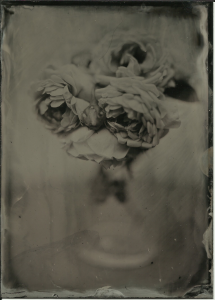 Roses from bush in front of house, glass vase, grey table in front of white wall. Partly sunny. f4.5 or so, 3 seconds, Old Workhorse collodion (about a year old).